REDEVELOPMENT - BJAAM Environmental Inc.
Brownfields redevelopment has been a focus of local economic development efforts and private development strategies for much of the last decade. Many areas of the country are challenged by Brownfields which are often bypassed by redevelopers due to environmental uncertainties. 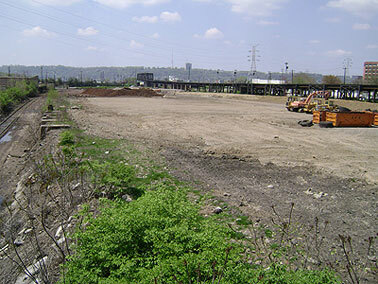 Other developers have found extreme value in purchasing remediated Brownfields due to the (often) lower cost of the property and existing improvements to the real estate. Although environmental uncertainties are a basic real estate issue, innovation and creativity are required to ensure successful redevelopment. BJAAM’s Brownfield professionals possess unique expertise in Brownfield deal structures including public/private partnerships, Cost-to-Closure contracts, and participation in an equity positions to complete complex risk transfer in real estate transactions. Environmental Liability Risk Transfer programs, such as Contract-to-Closure (CtC), pioneered by BJAAM, provides a unique solution for companies seeking an exit from their legacy of environmental liabilities or long-term closure obligations. The scope of the liability risk transfer can range from a commitment to remediate a site for a guaranteed fixed price or the outright transfer of the assets and associated liabilities. BJAAM’s CtC program provides an organization the ability to transfer the responsibility and management of known contamination issues, large or small, for a single facility or group of properties. By involving BJAAM professionals early in a project, Brownfields initiatives have gained creativity, efficiency and capital to address the complex development problems facing local governments and special purpose community development organizations.